How Virginia’s Ken Cuccinelli is transforming the AG’s office into an ideological battleground. The move set off a firestorm, complete with comparisons to John Ashcroft’s purchase of $8,000 drapes to cover up the Justice Department’s classical statues. But Cuccinelli remained unfazed—in fact, throughout his first year in office, he’s clearly relished his role as a political lightning rod. He’s one of a group of crusading lawyers who’ve helped transform the state attorney general’s office—a position once considered a bureaucratic backwater—into a launching pad for ideological warfare. State AGs have a broad job description, which has enabled officeholders of both political persuasions to take liberties with the position. Still, until the 1990s, the job rarely drew much attention. “It used to be as exciting as being head of the highway department,” says Michael DeBow, a law professor at Alabama’s Samford University and a former advisor to the state’s onetime Republican attorney general Bill Pryor. Then, in 1994, Mississippi’s Democratic AG, Mike Moore, took on Big Tobacco, leading an unprecedented multistate lawsuit to recoup health care costs from cigarette manufacturers. The case, which led to a landmark $246 billion settlement, inspired other progressive AGs to launch their own campaigns against corporate malfeasance—then use them to climb the political ladder. New York AG-turned-governor Eliot Spitzer, for one, earned his reputation as “the people’s lawyer” by suing big Wall Street firms for committing fraud, Midwest power plants for causing acid rain, and drug companies for concealing information about clinical trials. The implications of this shift have become clear in the current lawsuits against health reform, one of the biggest challenges that state AGs have mounted against a federal law since a group of Southern attorneys general fought school desegregation in the 1950s. Though most constitutional experts doubt the AGs will prevail, their efforts have complicated implementation of the law and inspired legislative challenges that could stand a better chance of succeeding. Cuccinelli argues that he’s no activist AG, pointing out that he’s legally required to render opinions when a legislator requests them. “It is him reacting to events, not causing them,” insists his spokesman, Brian Gottstein. It’s true that some of the inflammatory legal opinions he’s issued—on immigration, abortion, and religious displays—have come at the behest of GOP Delegate Bob Marshall, an early supporter of Cuccinelli’s. (Though such opinions aren’t legally binding, they establish an important legal precedent for future legislation or executive orders.) But Marshall himself admits that he wouldn’t have sought such opinions if Cuccinelli and Republican Gov. Bob McDonnell weren’t in power. “Now the opportunity is different,” he says. 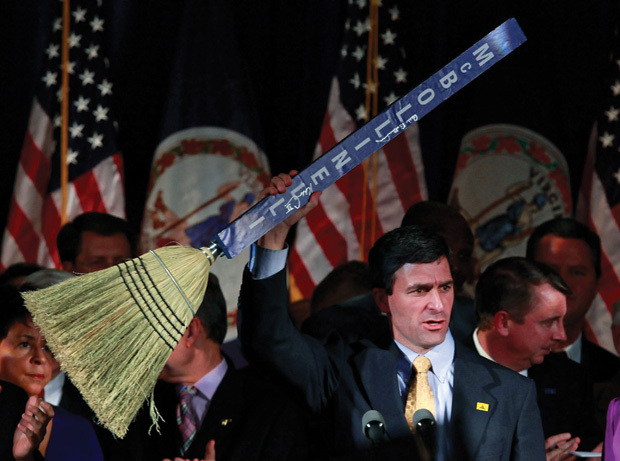 But if Cuccinelli has at times been a foot soldier in a broader conservative war, he’s also launched his own battles. In March, Cuccinelli advised Virginia’s public universities and colleges against extending nondiscrimination protections to gays and lesbians—a move McDonnell ultimately derailed. Less than two months later, Cuccinelli attempted to subpoena former University of Virginia scientist Michael Mann—best known for his “hockey stick” graph showing a rise in global temperatures over the last century—for allegedly producing “falsified” data on climate change, an investigation that critics dubbed a witch hunt.